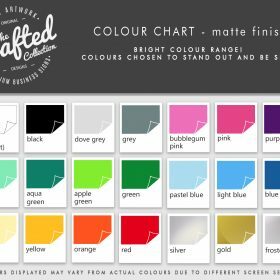 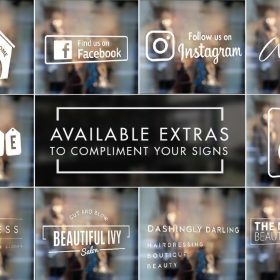 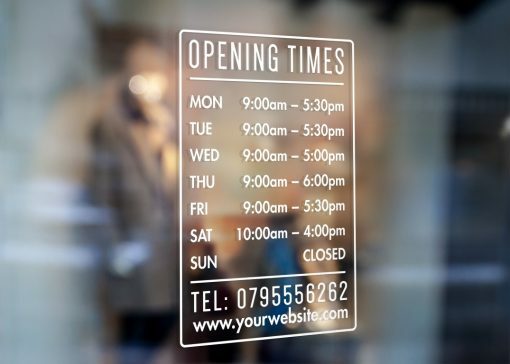 Opening Hours Times Shop Custom Vinyl Sign Sticker – Easy To Apply & Self Adhesive. 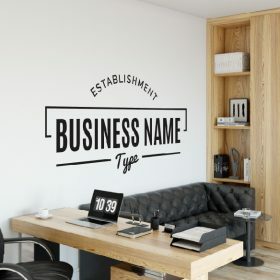 Suitable For Windows, Walls & Many Other Surfaces. 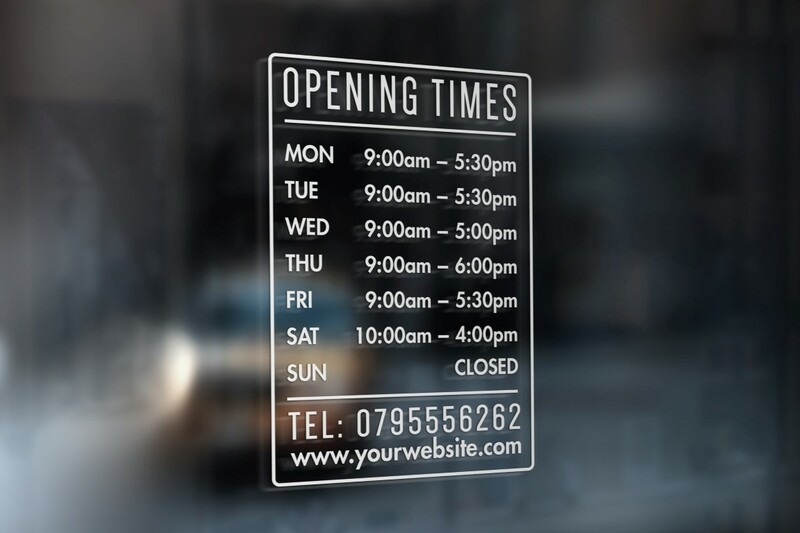 A professional looking opening hours times shop custom vinyl sign sticker for your business. 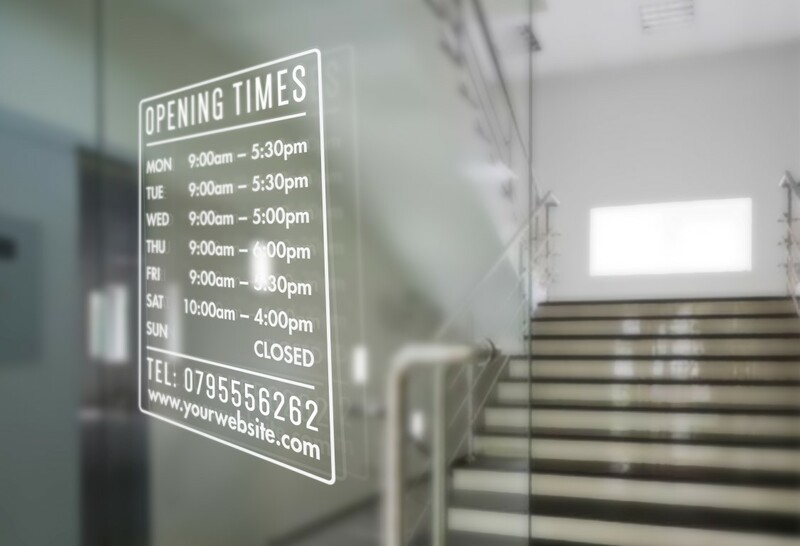 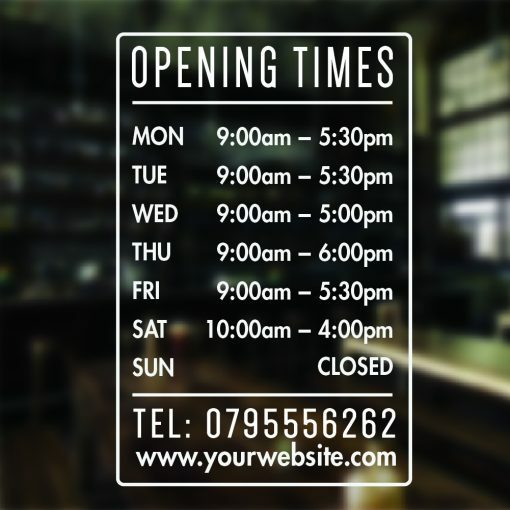 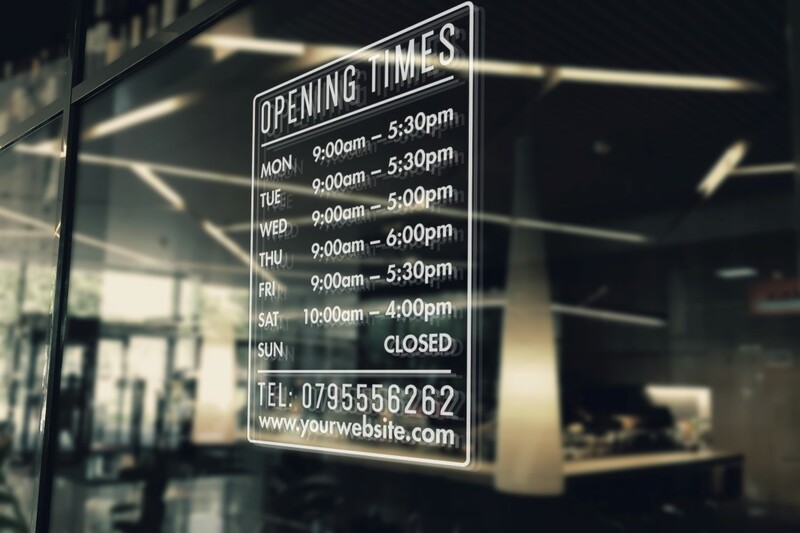 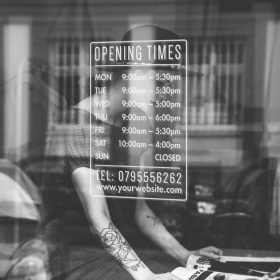 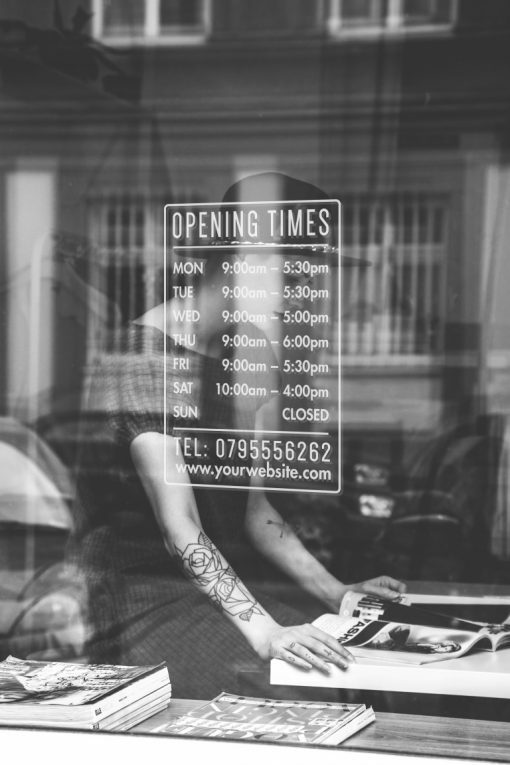 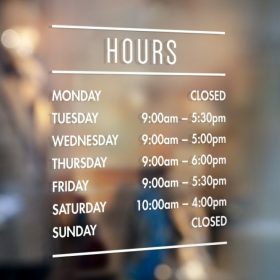 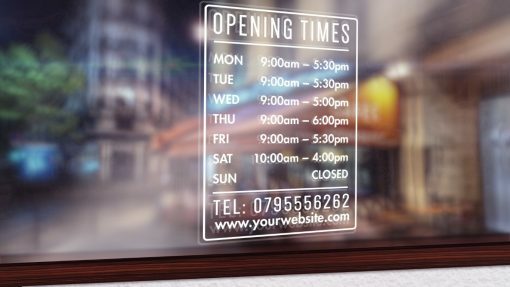 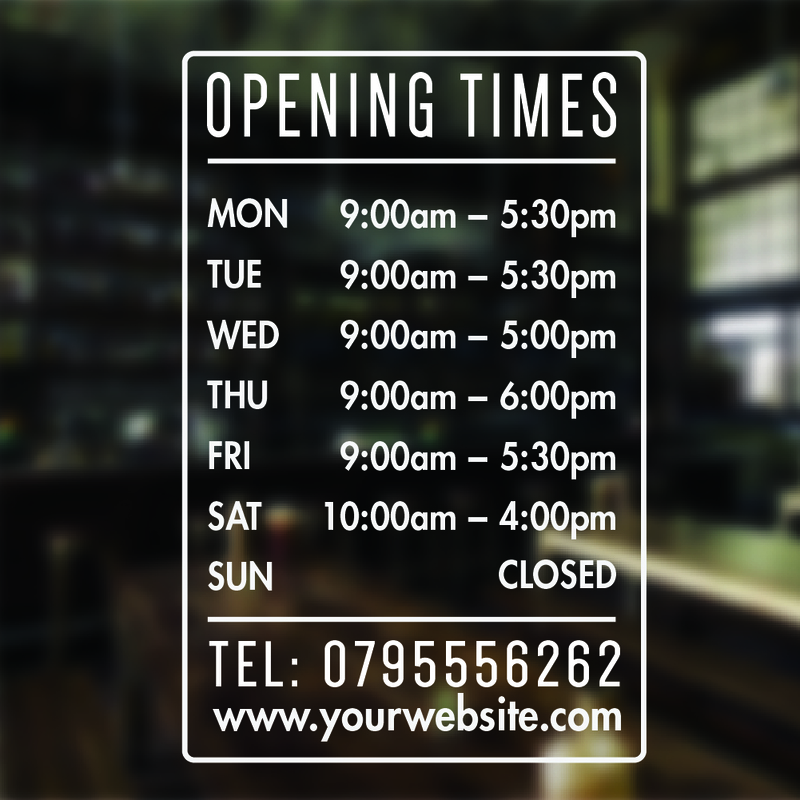 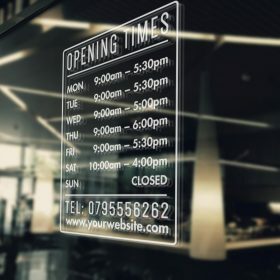 This stylish opening hours times sign will stick firmly on your shop window or office door to display your opening times. 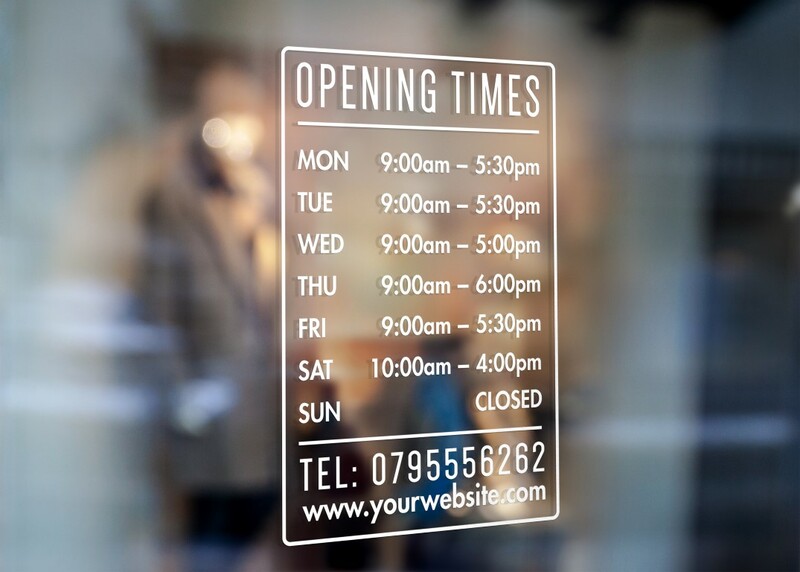 This opening hours times sign can be applied to windows, doors or any flat surface. 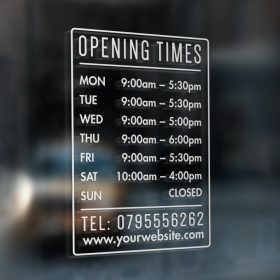 Very popular with shop windows and doors, looks great on glass. 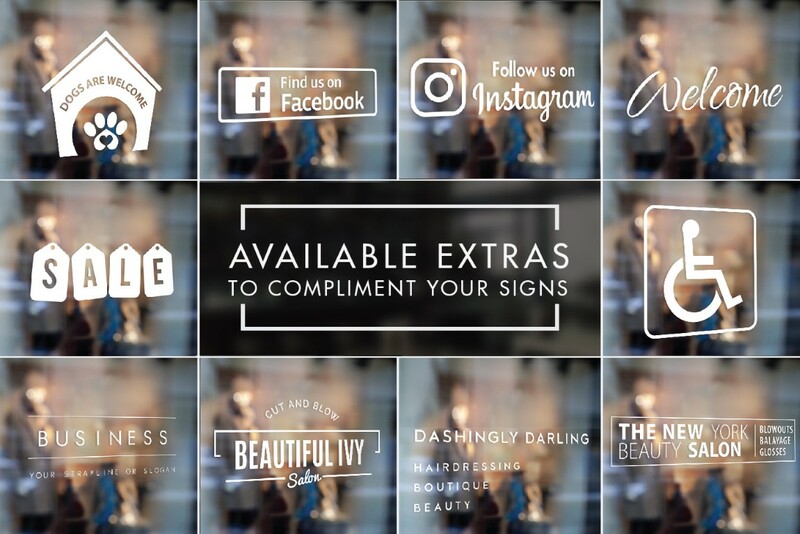 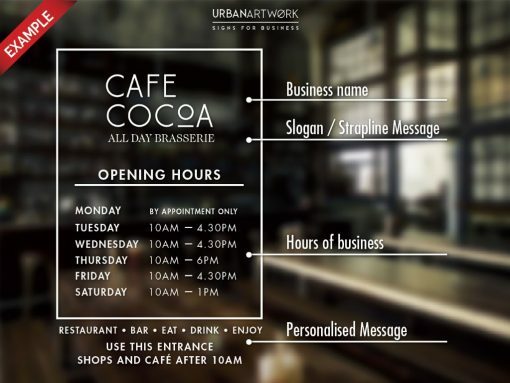 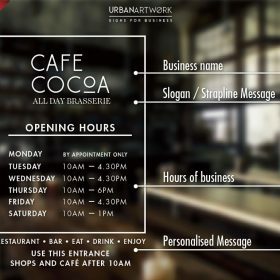 Opening hours signs can be used by any type of business, shops, salons, dentists, offices, factories and more. 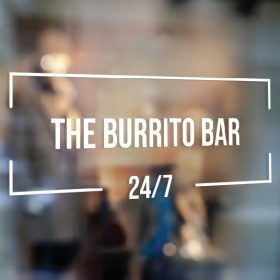 Let your customers know when you are open. 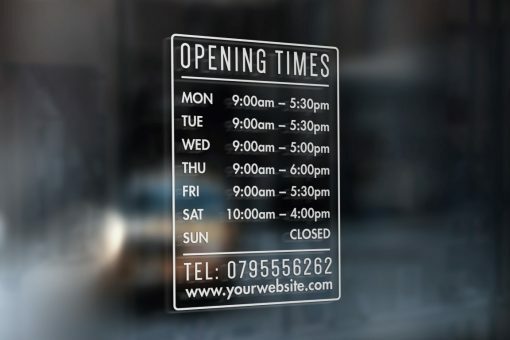 HOW TO ORDER: Simply enter your business days and hours in the notes box along with optional business name and telephone number and we will customise this opening hours times sign sticker with your opening hours, when you receive this product it will be ready to apply to your preferred surface, very quick and easy. 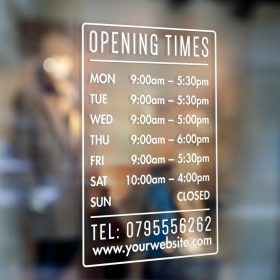 This item is produced in a mirror format so as to be read correctly from the outside when fitted on the inside of your window or glass door. 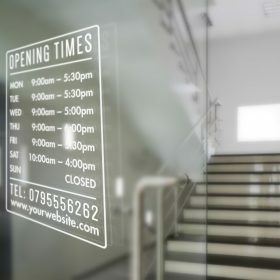 If this is not for a window or glass door please choose OUTSIDE from the options. 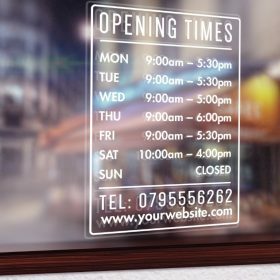 Many people choose to stick these on the inside of windows/glass doors facing out, in which case choose INSIDE, however if you are sticking it on a painted surface then choose outside. 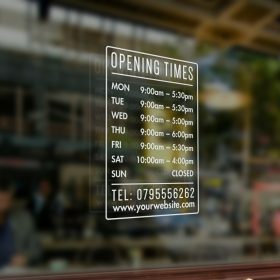 This opening hours times shop custom vinyl sign sticker will be provided in inside format (reversed) by default unless chosen otherwise. 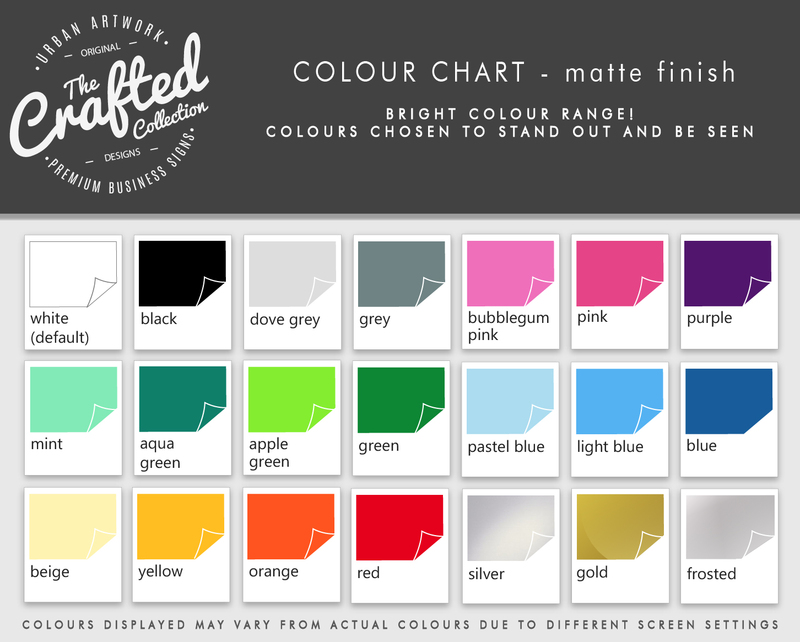 Available in white or black, please choose your colour from the options (will be provided in white unless chosen otherwise). 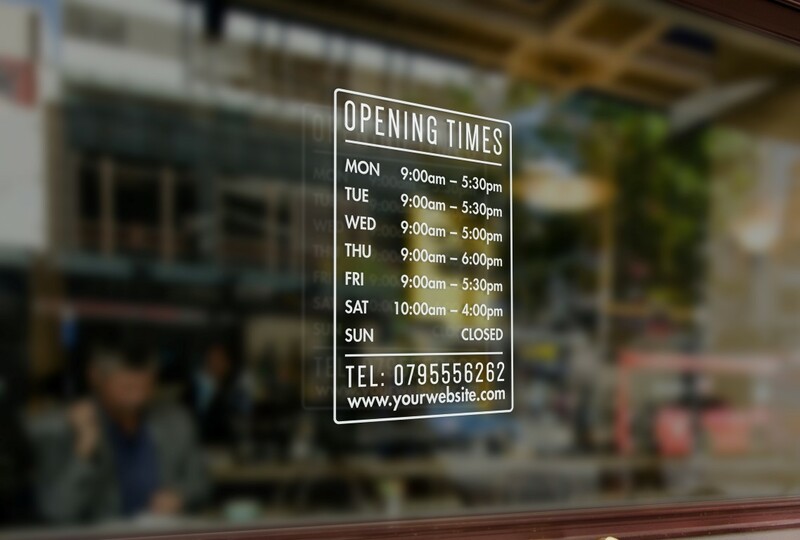 Really happy with the window sign. 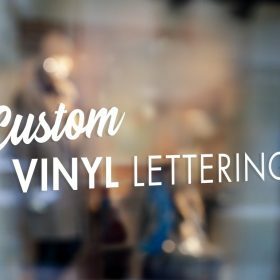 Installation was really easy enough and looks really slick.